I kneel before you and I humbly ask for your Eternal Guidance as we, the whole Filipino people vote for our country’s next president. We have been afflicted by so much greed for the past years,and now that we’ve learned our lessons, please remind each of the Filipino voters how hard most of us suffered because of a wrong choice. Keep us away from temptations, as many of these candidates will present worldly things and promises in exchange for our votes. Lastly, make us remember that we are voting not only for ourselves, our country but most especially for our children. 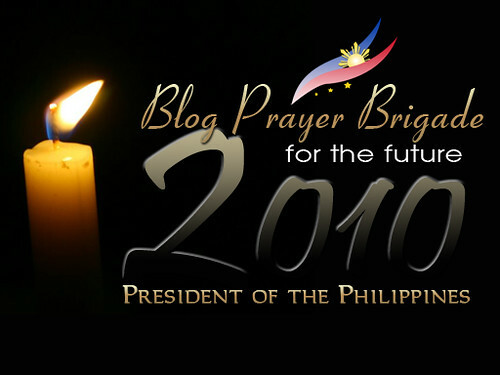 I, Renz, support the cause of the Blog Prayer Brigade for the election of the Future President of the Republic of the Philippines and I do solemnly promise to recite the prayer, which I wrote, in my own convenient time and regularly as possible until the 2010 Presidential Election commences. Let it be written, let it be done. 2, Publish the prayer for everyone to Read in your blog. 3. Go to the Blog Prayer Brigade Main Page which is located here, and get one of the badges or banners for the brigade. Place the badge or banner in your Sidebar until the 2010 Presidential Elections commence. I, (your name) support the cause of the Blog Prayer Brigade for the election of the Future President of the Republic of the Philippines and I do solemnly promise to recite the prayer, which I wrote, in my own convenient time and regularly as possible until the 2010 Presidential Election commences. Let it be written, let it be done. 5. Tag at least 7 Pinoy bloggers you know who haven’t done this before so that the prayer will spread wherever there is a pinoy blogger present. 6. Keep you promise of praying for the Presidential Election so that God may guide us in choosing the right leader for our country. 7. in January 2010, we will gather all the names and prayers of each participants and publish all their prayers in one Blog. We will also feature in the blog the most beautiful prayer ever composed in this project.